This topic contains 106 replies, has 43 voices, and was last updated by kristina 2 weeks, 2 days ago. 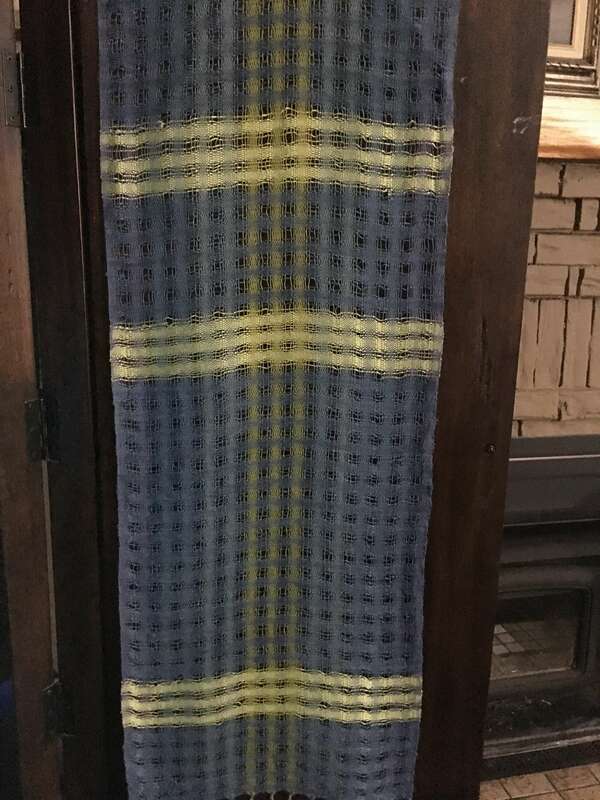 Here’s my 3rd scarf. I must’ve posted it incorrectly the first time – sorry. 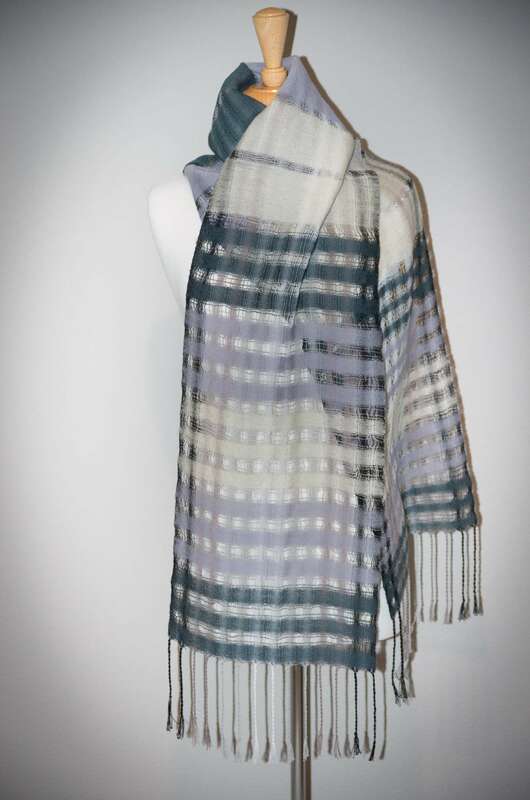 The weft is 2-ply wool in charcoal, dove grey and cream white. 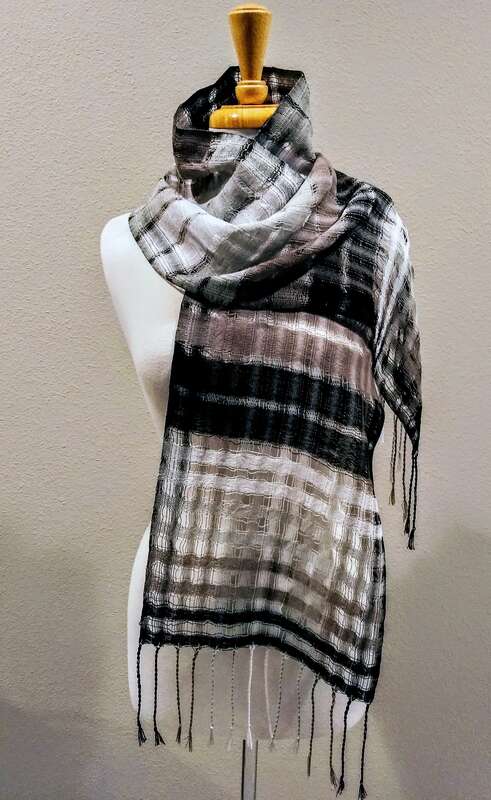 The 4th scarf I made is probably my favorite. Husband grimaced when I said I was using pink, but I like it. For some reason it reminds me of old fashioned fashion, early Vogue, Breakfast at Tiffany’s…. Anyway, pink and cream white wool weft. 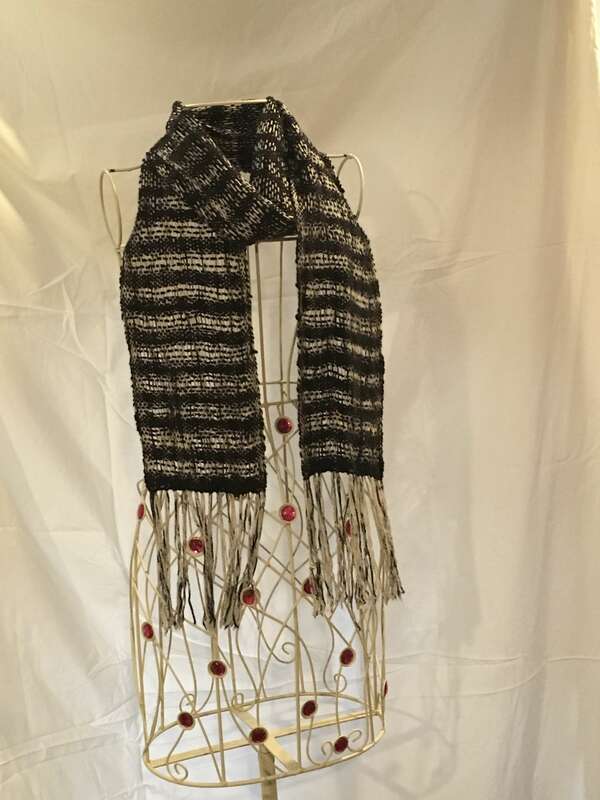 Here’s my 2nd scarf: charcoal, buff and cream white wool for weft. This reply was modified 2 months ago by dlgorham. Denting episode is so much fun! I made 4 scarves; first using 16/2 cotton and the others w/2-ply wool just as fine as the cotton. What a riot. 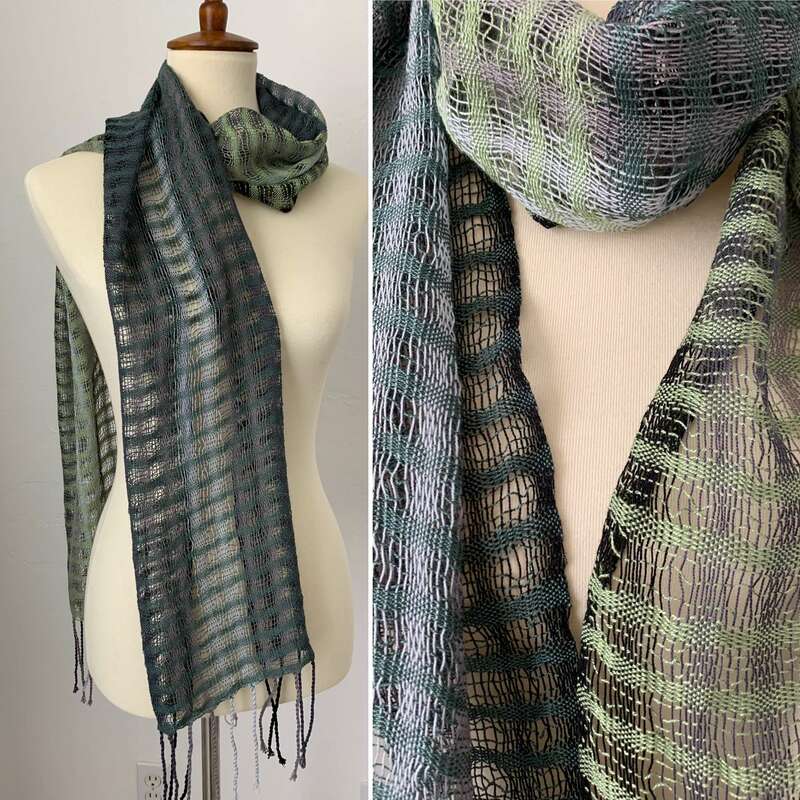 My scarf was woven with 2/16 cotton and 2/20 tussah silk. My samples were cotton (a few shots with sequins) and zephyr wool/ silk. 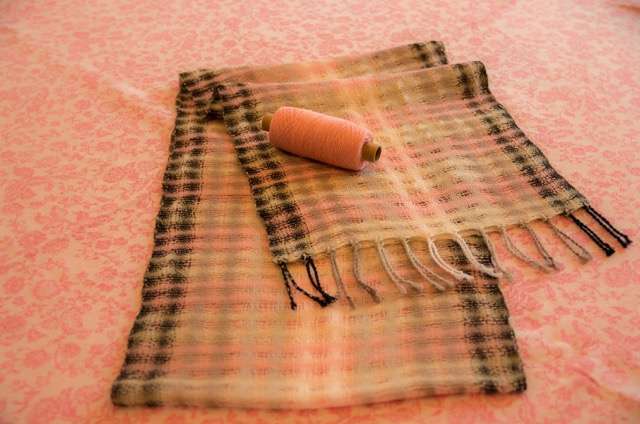 Would I open up to 20 epi or make spaces larger for a scarf as the spaces were smaller due to blooming of zephyr? This reply was modified 2 months ago by kathleen ready. Have you pressed them, Sylvia? They do look gorgeous! I love the episode with denting. 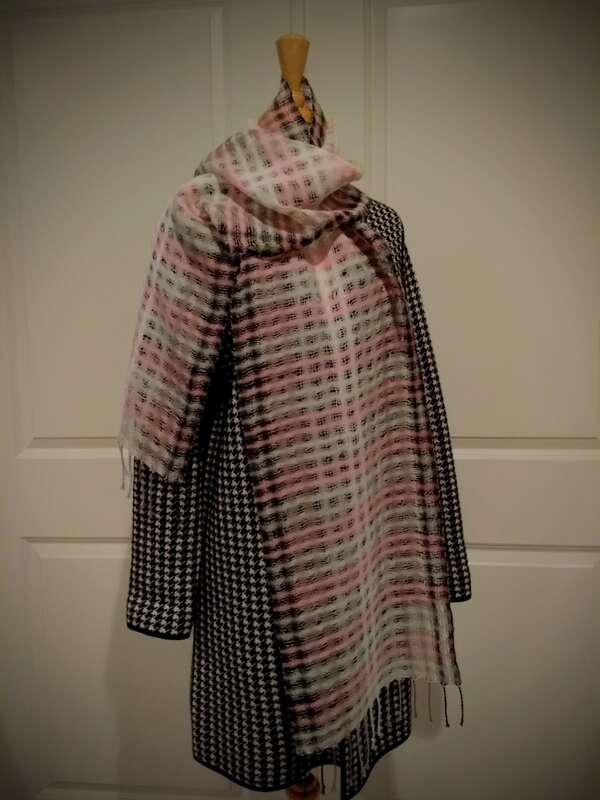 Have a question in regards to washing and the feel afterwards. 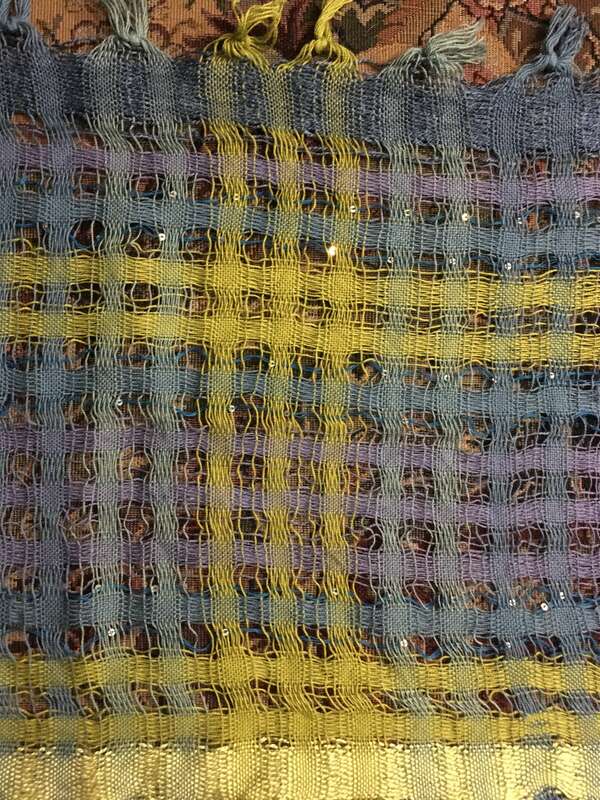 My sampled 16/2 cotton and 16/2 cotton warp with 30/2 silk weft, have great drape, but they feels a bit crisp. With the materials and the drape have thought they were softer. Used Dawn to wash them and followed what Jane did in the video. Any suggestions on how to make them softer? Thanks Penny for posting, really interesting to see just how much that wool/alpaca bloomed. 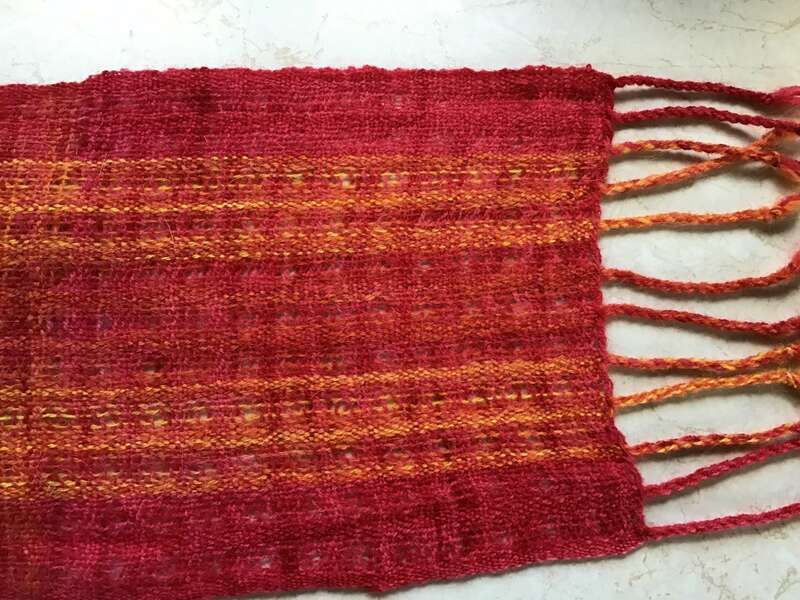 On the loom, off the loom and now washed and ironed. 70%wool 30% alpaca sett at 20epi, but the holes have all but disappeared so I think I could have widened the sett quite a bit. Still, apart from some wavy edges it is lovely and light and feels so soft. Next time I’ll do a bit better! Annette, your white scarf is beautiful. 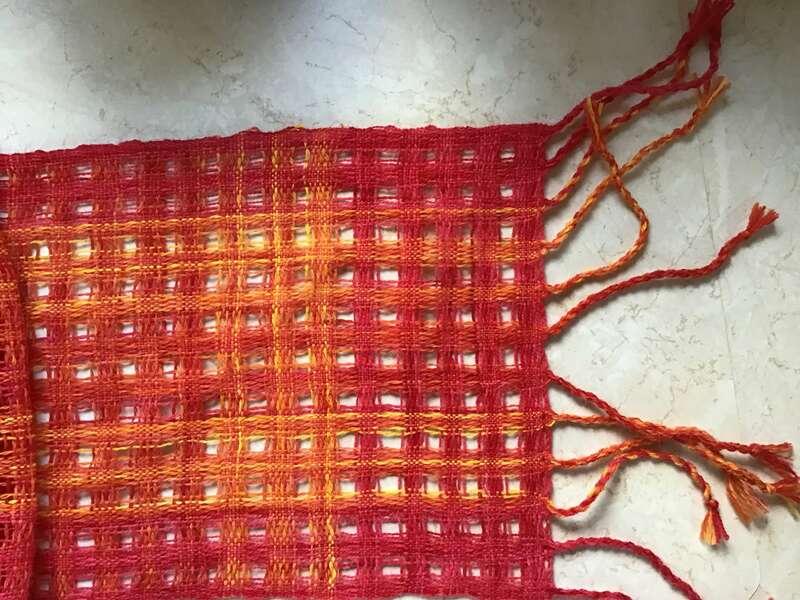 I’m relatively new to weaving and haven’t heard of “twist sett”, can you explain please? 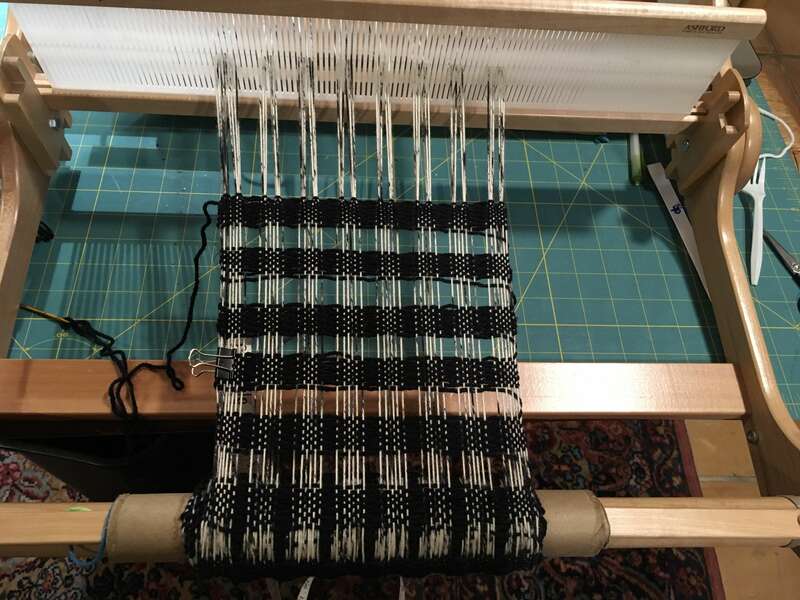 Taking advantage of plain weave and my rigid heddle loom. Using DK wool alpaca/merino with 12.5 RH reed, with 6 dents filled and 8 dents empty. My sample with 6 dents threaded and 6 dents empty didn’t have warp empty spaces, so I increased the empty dents to 8. 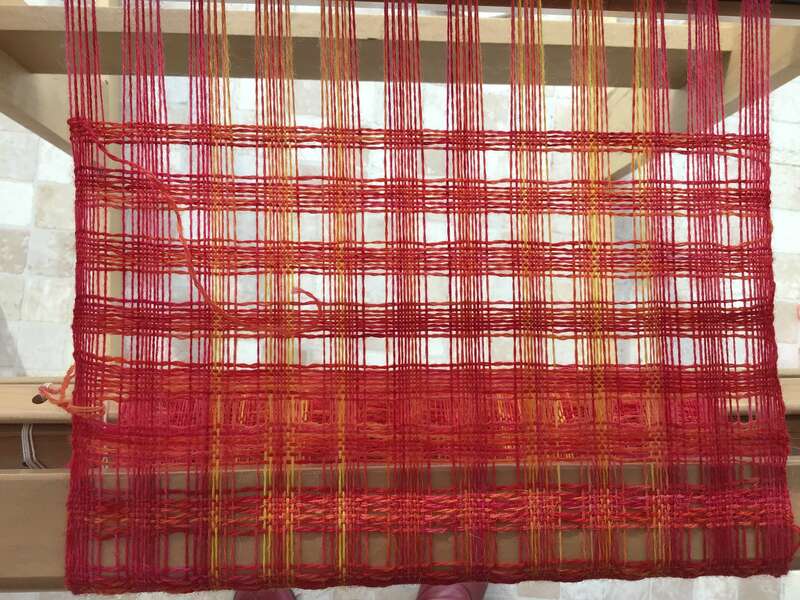 Sadly, the final version didn’t have the open spaces between the warp threads but the weft had a lovely effect. Any suggestions on how I might achieve more of the empty square effect? This reply was modified 2 months, 1 week ago by heidi. In order to make the math easy I just used a 10 dent reed and wound 110 ends, two per dent, 5 dents empty just as you thought. So 11 “stripes”. I found I was starting to break end threads so loosened my tension quite a bit, which solved the problem. Tencel can be a bit fussy. Hope that’s helpful. Thanks for the kind words. I was pretty pleased with the way it turned out Looking forward to seeing yours! 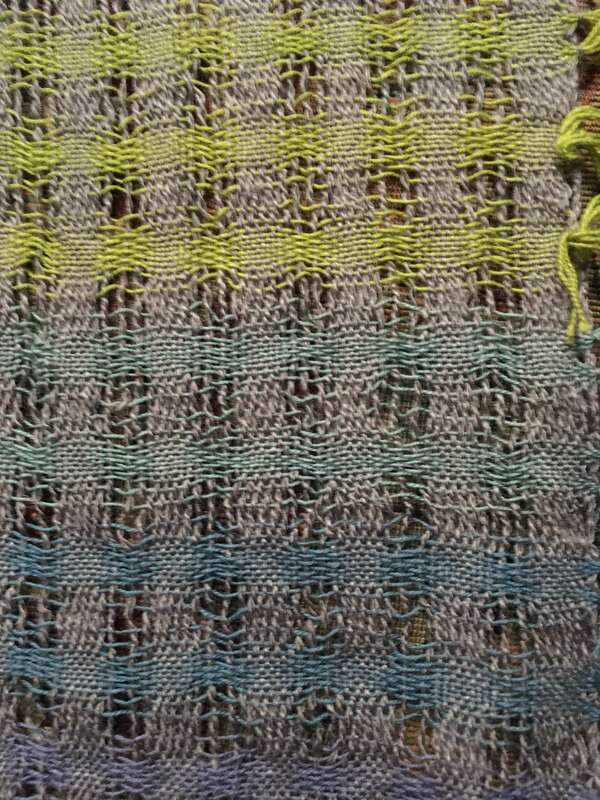 I am using 8/2 variegated tencel and think your scarf is lovely! Would you mind sharing your set up? I was planning on using 20 epi just for simplicity. (2/dent for 5 dents with 5 empty dents) Is this what you did? I’ve started a 3-1/2 yard warp but haven’t finalized how many ends yet, what did you have? Any tips or suggestions would be greatly appreciated. The last time I used tencel was not a fun experience–so many broken threads. I am going to use my table loom that has flat steel heddles so hopefully that will help. This reply was modified 2 months, 1 week ago by the1to1.